With Brexit on the back burner, City investors are refocusing on the US-China trade talks....and welcoming upbeat comments from Treasury secretary Steven Mnuchin over the weekend.
. That could be a sign that the deal being drawn up has teeth. We’ve been here before, of course -- optimism doesn’t always translate into concrete action. But both sides are keen to get a deal, especially after last Friday’s import and export data showed US trade with China has slumped over 11% this year. , with China’s Shanghai Composite inde x up 0.6%. enltrRisk on sentiment greets European traders this morning as Asian stocks rally on hopes of a US-China trade deal. , with China’s Shanghai Composite index up 0.6%. Japan’s Nikkei surged by 1.4%, hitting its highest level since last December. European markets are expected to post gains today too: Also coming up today Goldman Sachs releases its latest financial results before Wall Street opens; analysts predict that revenue fell 10% year-on-year in the first quarter of 2019. Plus, the latest Empire manufacturing report will show how factories in New York state are faring this month, and whether trade tensions are hurting. 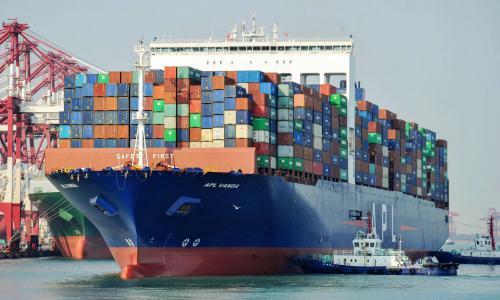 The agenda Noon BST (estimate): Goldman Sachs results for Q1 2019 1.30pm BST : The New York Empire State Manufacturing Index released 2161 false false A US cargo ship berthing at a port in Qingdao in China’s eastern Shandong province earlier this month. Treasury Secretary Steven Mnuchin at the International Monetary and Financial Committee conference at the World Bank/IMF Spring Meetings in Washington on Saturday, April 13, 2019 .